The Birth of Venus painting by Sandro Botticelli truly stands out in a crowd. The painting was created in 1486 in Florence, Italy. The Birth of Venus is mysterious, in that, there are no recorded documents identifying its exact meaning or by whom it was commissioned by. The first noted connection with the Medici family was in 1550 in Giorgia Vasari’s book of artist biographies entitled, The Lives of the Most Excellent Painters, Sculptors, and Architects. The Medici family greatly favored Botticelli’s paintings. The painting comes to life as some of its interpretations are told. Notice, Venus, rising from the sea. On the viewers left the god of winds blows her to shore as he carries the gentle breeze in his arms. On the right, the goddess of seasons spreads out a robe of flowers to welcome her to shore. Some interpretations represent truth and wisdom, while others represent mystery and divinity. Venus is often a symbol of pagan and Christian love. Botticelli, an Italian artist in the Early Renaissance, was best known for this beautiful painting, as well as Primavera and Spring. The colors used to create The Birth of Venus do not catch the eye by accident. Botticelli created the colors using tempura pigments; implementing a unique blend of egg white to the mixture. Note the beautiful gold tone of Venus’ hair. Botticelli was known for his use of heavy outlines and for keeping the use of chiaroscuro to a minimum. I was drawn to this painting by the use of beautiful and unique colors as well as the mystery of the meaning behind it. It is a mystery that awakens interest and desire; a characteristic that artists strive for in their work. Botticelli puts great detail into each of his pieces and I greatly appreciate the intricacy– especially in The Birth of Venus. “Renaissance Art And Architecture.” Funk & Wagnalls New World Encyclopedia (2014): 1p. 1. Funk & Wagnalls New World Encyclopedia. Web. 8 June 2015. “Botticelli, Sandro.” Funk & Wagnalls New World Encyclopedia (2014): 1p. 1. Funk & Wagnalls New World Encyclopedia. Web. 8 June 2015. “Birth of Venus” Artable 2015. web. 8 June 2015. “The Birth of Venus” Italian Renaissance Art 2015. web. 8 June 2015. I also am very fond of this painting as well. Not only for the incredible colors and amazing detail, but also because of the mystery behind it. It is almost a shame that there isn’t much information available on who it was commissioned, because I would love to know the complete history of this piece. 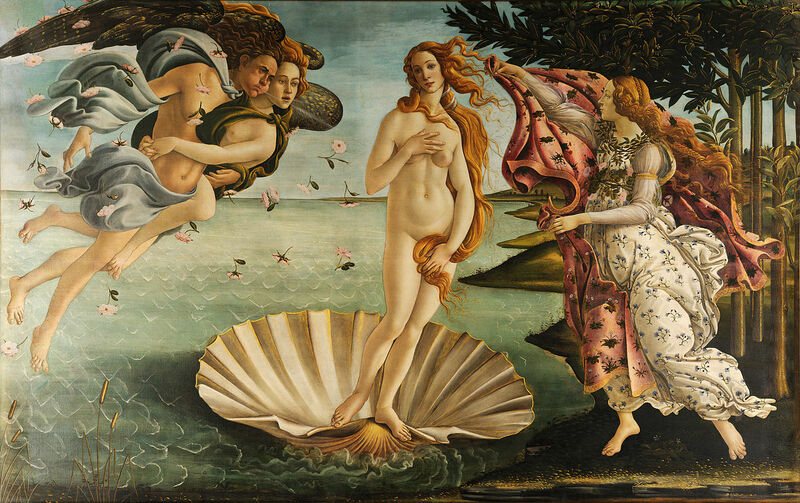 I found a great resource that dives into the method of Botticelli’s works. Botticelli still remains my favorite Renaissance artist.